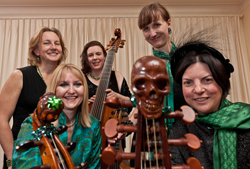 Josie and the Emeralds comprises Josie Ryan, soprano and The Emerald City Viols. Josie Ryan is one of Australia’s leading early music sopranos, having recently returned from many years performing with major early music ensembles in Europe. The Emerald City Viols was founded in 2011 by Brooke Green to perform exquisite consort music for violas da gamba, principally by English, Italian and Spanish composers of the 16th century. Previously a baroque violinist, based in London, Brooke Green has spent the last few years studying viol with Wendy Gillespie, a founding member of the viol consort Fretwork who performed at Margaretta Cottage in Glebe some years ago. 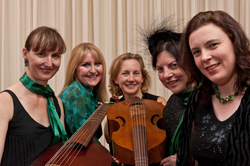 For this concert The Emerald City Viols includes Brooke Green, treble viol; Fiona Ziegler, tenor viol; Catherine Upex and Elizabeth Rumsey, bass viols. Fiona Ziegler is a versatile player of several stringed instruments but chiefly performs with the Sydney Symphony as Assistant Concertmaster. Catherine Upex performs in ensembles such as Zarabanda and Thoroughbass. Elizabeth Rumsey is now based in Basel and in November she will be making a rare visit to Sydney. 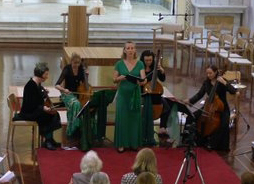 Josie and the Emeralds programme for the Glebe Festival is titled “I Call and Cry” and features sacred and secular love songs and consorts from the 16th century by William Byrd, John Dowland, Thomas Tallis, Jacques Arcadelt and Antonio de Cabeçon. There will also be an arrangement by Brooke Green of Andrea Pandolfo’s Albanese depicting the plight of Albanian asylum seekers and dedicated to boat people everywhere. Tickets $30 at the door or $20 concessions and early bird - for early bird phone 0422-334-054 or book up to and including 25th November. Elizabeth Rumsey began her musical studies at the Sydney Conservatorium in Australia, and after a Bachelor degree and Postgraduate Diploma on recorder with Howard Oberg, moved to Europe for further study on recorder and early bowed string instruments. She studied with Randall Cook (Fiddle) and Rebeka Ruso (Viola da gamba) at the Schola Cantorum Basiliensis, with a focus on Medieval music, and in 2005 graduated with honours in Medieval Fiddle. Her main repertoire is music of the 15th and 16th centuries, with brief forays into the modern world of Telemann trios and Bach Passions. In addition to working with her own viol consort, she plays regularly with small and large ensembles based in and around Switzerland (Chant 1450, Profeti della Quinta, The Earle his Viols, La Morra, Leones, Ensemble Daedalus among others), and has made many CD, television and radio recordings.